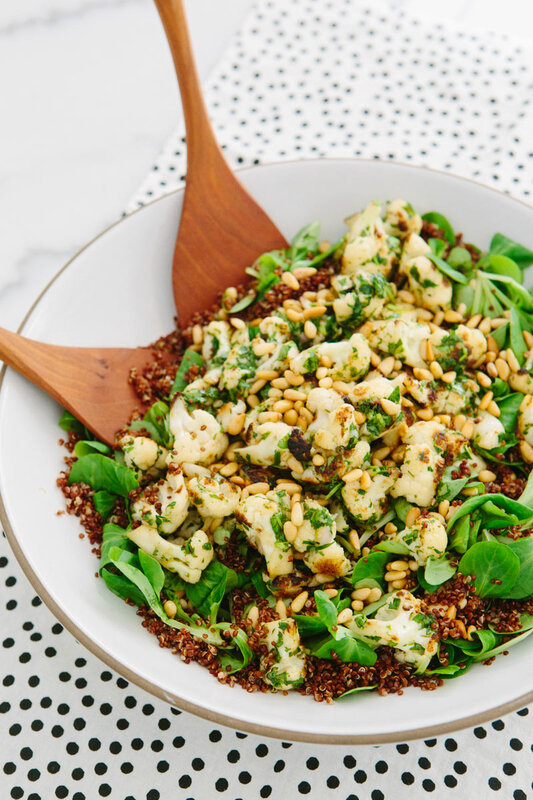 In a medium mixing bowl combine parsley, cilantro, garlic, shallots, lemon juice, 1 1/2 cups olive oil, vinegar and 3/4 teaspoon salt (more to taste), stir thoroughly and set aside to allow flavors to develop while prepping the rest of the salad. Place 2 cups of quinoa and 3 1/4 cups water into rice cooker and turn on. 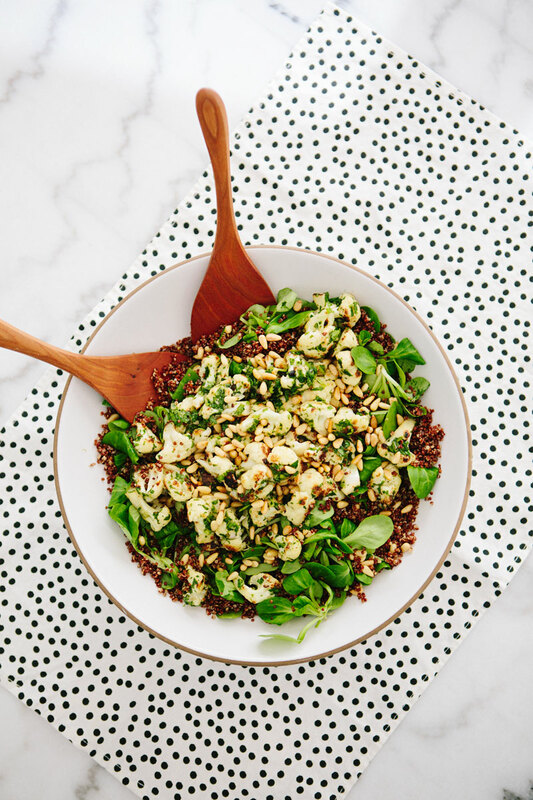 Once quinoa is cooked, fluff with a fork and set a side to cool. To prepare pine nuts preheat oven to 375 degrees. Place pine nuts in oven on a lined baking sheet and roast for 3-5 minutes or until light brown, stirring often. * keep a close eye, pine nuts can burn quickly! 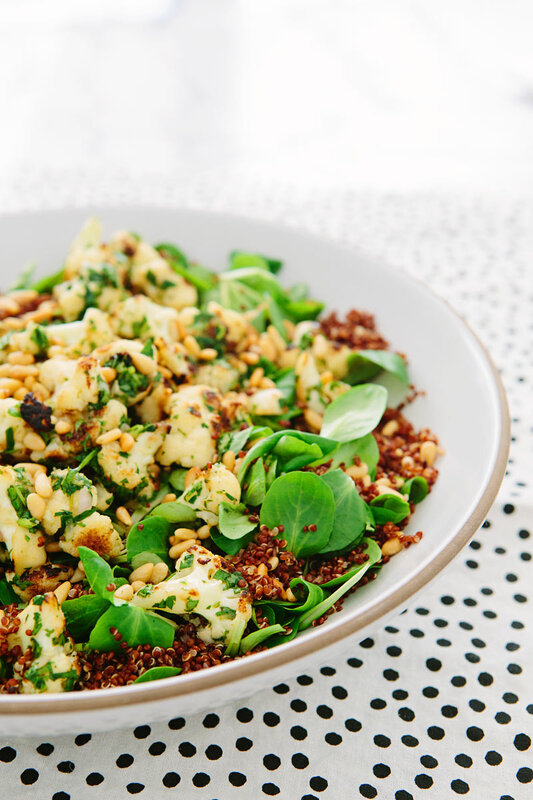 To prepare cauliflower, remove stems and leaves and cut into small 1 inch pieces. Heat 3 tablespoons olive oil over medium low in a large saute pan. Add cauliflower, 1/4 teaspoon and an extra pinch of salt to pan. Saute cauliflower, stirring occasionally until well browned and soft. 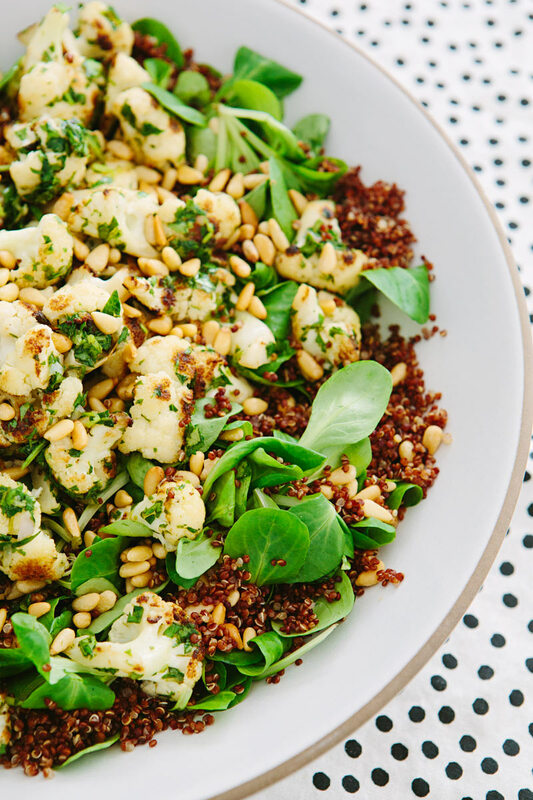 Transfer cauliflower to a medium mixing bowl, add 1/2 cup chimichurri and toss to coat. Place mache into a large serving bowl. Add 2 1/2 cups of cooked quinoa. Drizzle well with olive oil, the juice of one lemon and salt to your liking. 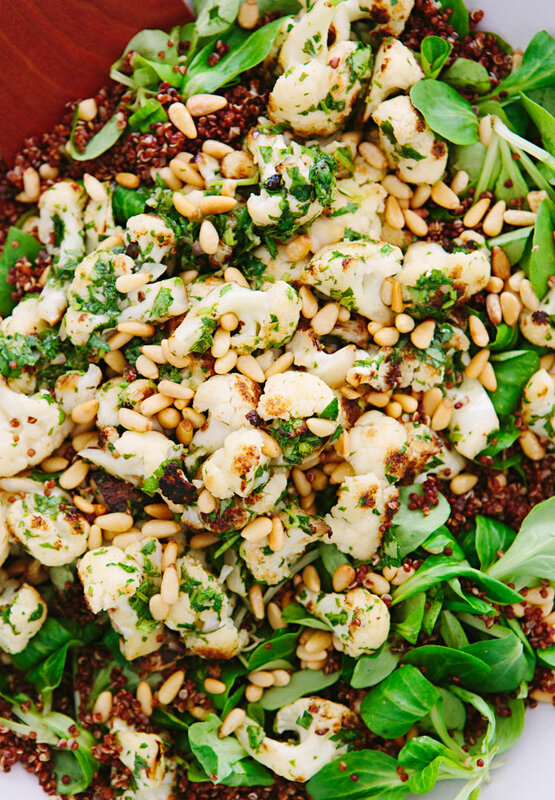 Add cauliflower and sprinkle with pine nuts. Sprinkle Maldon slat and fresh cracked pepper to taste. Enjoy! There will be extra chimichurri and extra quinoa left over! Both will be amazing mixed into a variety of other dishes. Yes! i love this – it looks amazing! Yum! This sounds incredible! I’m looking forward to trying this one! Mache is one of my favorites, too. This is such an inspired salad. Love the roasted cauliflower. Can’t wait to make this one! I can see why this is a favorite of yours. I can’t get enough of cauliflower lately. I just pan seared it and poured some lemon tahini sauce, and now I have to buy some more to make this dish. Mache rosettes are wonderful, have you tried sweet pea leaves…they are just as sweet as the peas. Happy feasting. Hmmm, delicious. This one will be my new year’s salad. I’ve never had mache or chimichurri. I think that needs to change. Pinning and making this salad soon. Gorgeous! I am so obsessed with cauliflower right now. Must make this. Made this over the weekend and it received rave reviews! I used brown quinoa and a kale/chard/spinach mix (couldn’t find mache at Vons or Gelsons). Also bought some take and bake bread to serve along with the extra chimichurri. Unfortunately I wasn’t able to try it because of a bad wine allergy. Do you have any suggestions to sub in for the red wine vinegar? Thanks!